This earthquake reached its greatest intensities around Waiotapu and the Waikite Valley. Isoseismal map of the Waiotapu earthquake. 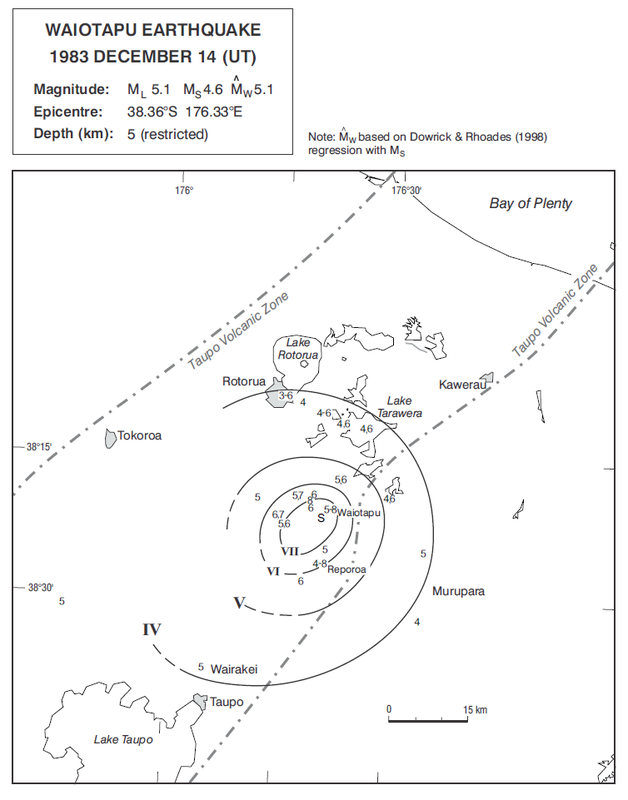 Courtesy Atlas of isoseismal maps of New Zealand earthquakes (2nd edition): Downes, G.L. ; Dowrick, D.J. Twenty months of local swarms preceded the earthquake that struck Waiotapu on 15 December, 1983. The quake was also felt in Rotorua, Tokoroa and Wairakei, but reached its greatest intensities around Waiotapu and the Waikite Valley. In this region roads built on loose or uncompacted material were damaged, and boulders up to 2m wide were dislodged from road cuttings along state Highway 5. The quake also triggered a landslide on the western face of Mt. Paeroa1.